I had one last English breakfast before I got back on the bike after a nice 8 day layoff. I had no idea how to get out of the city. It’s not often I have to use my GSP to navigate. Today was a good day to use it. I just made sure I was heading south west. It took me 20 km to get out of the city. It’s not too bad cycling through cities in China because there are very good cycle and moped lanes. Leaving during peak hour there were a lot of bikes to dodge. I stayed off the big roads and found as soon as I got out of Chendu I had a little bit of country before heading back into another sizeable city and back out into the country. After 70 km it finally got a bit more rural. I could put a tent just 20 meters from a shop. It was getting dark quickly so I went and asked the people sitting outside the shop if it would be ok. Thankfully they said it would but suggested I might like to sleep outside the shop on the fruit and veggie stand……….perfect. Saves putting up the tent. My hosts kindly fed me a solid breakfast of chicken, veggies and rice. I set off in another very foggy and damp day. I cycled only 50 km till I got to Baoguo at the foot of Emeishan one of the four most important Buddhist mountains in China. 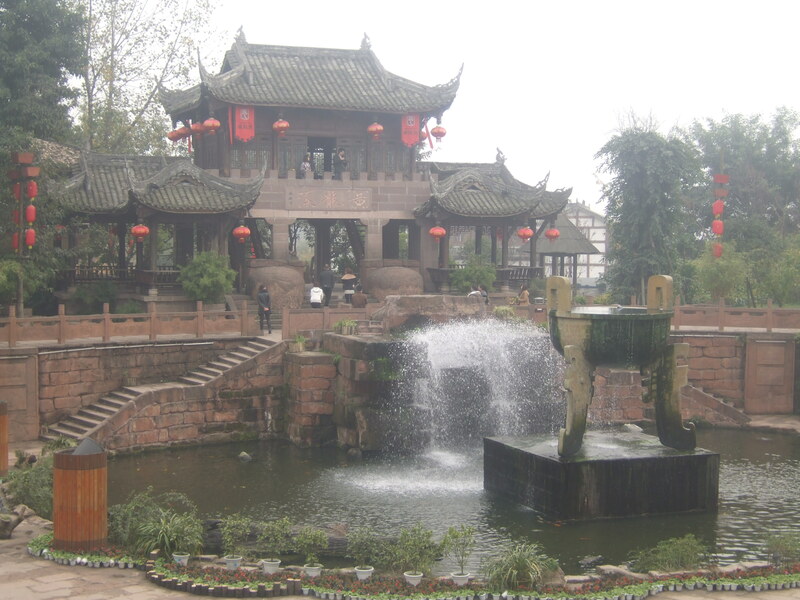 Baoguo is another very touristic town. 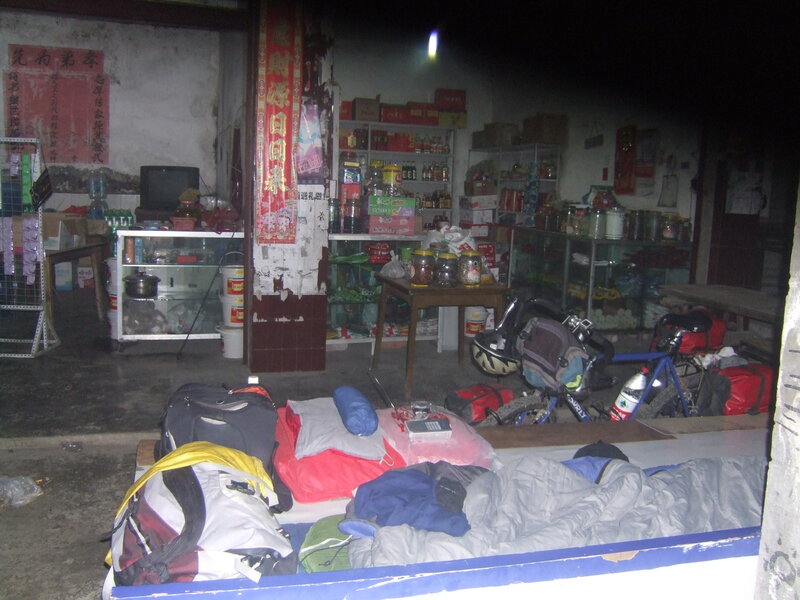 I found a nice hostel £3.50 for the dorm………..mostly Chinese tourists. 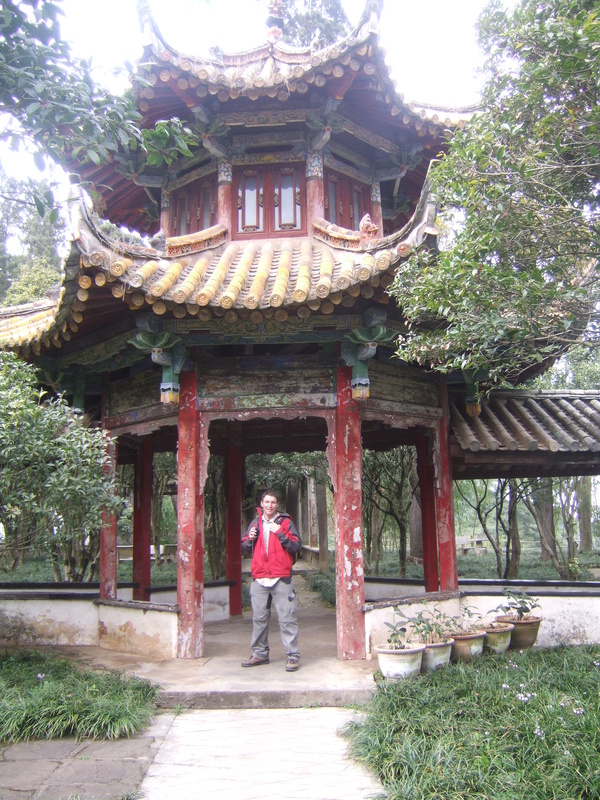 Arriving early…………I had half a day up my sleeve I walked a few kms up to Baoguo temple. To be honest they are all starting to look the same. 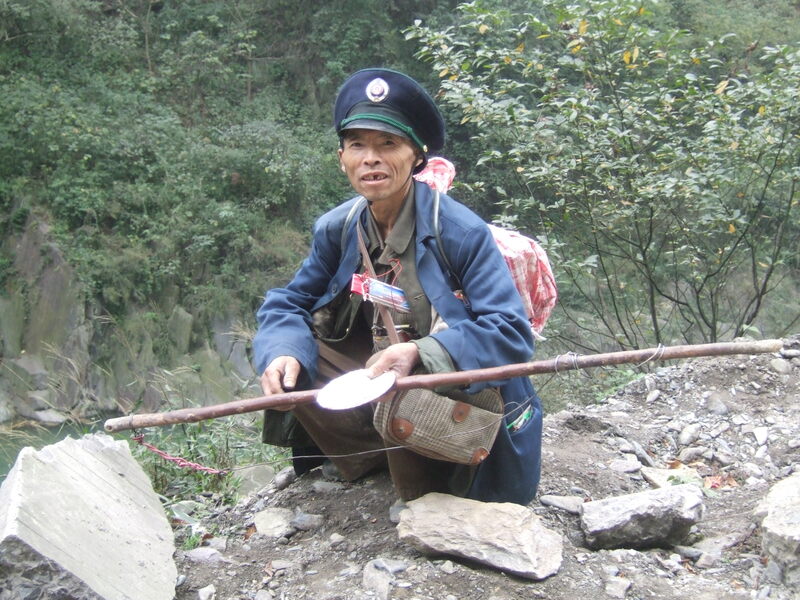 I walked another few kms up the mountain to Fulu temple………..same same………….I am starting to get templed out. I walked up via the road and took the path by the river back which was very scenic. 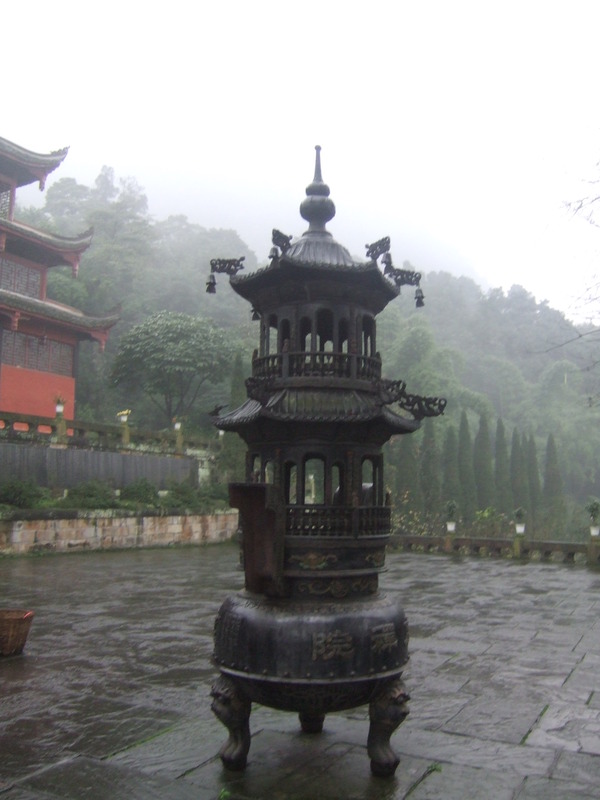 Then I got my first real taste of rain in China…………..it absolutely poured down and I got absolutely drenched before I could get back to the hostel…………..to make things worse I could wash my clothes but no drier to dry them. It’s a nightmare having to carry wet clothes. In the dorm are 3 Chinese girls who invited me for dinner. 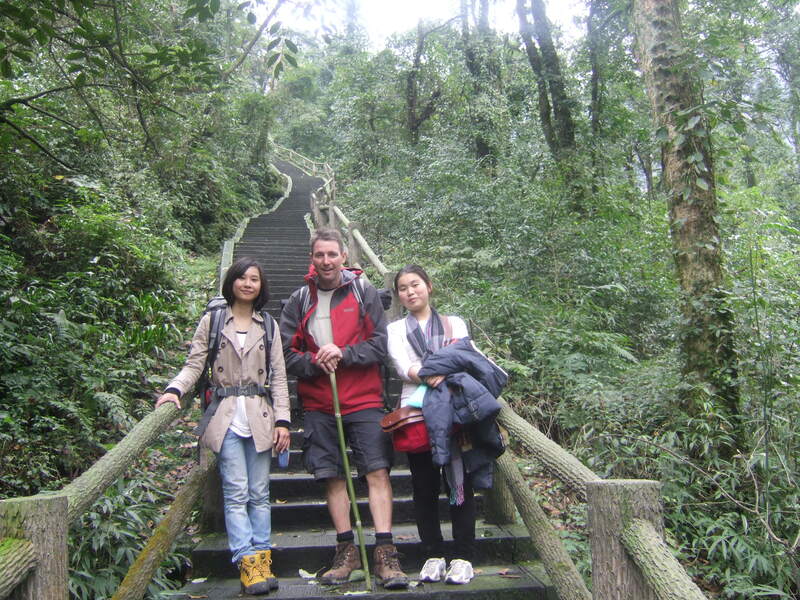 Tomorrow they are climbing the mountain for two days and asked me if I would like to join them. Their plan sounded really good. I liked the sound of sleeping in a temple and seeing some wild monkeys. After a little thought, because I should really be heading south……not for the first time, I thought what the heck and decided to join them. I then had to hurry out to get some food. No chance in the morning with a 6 a.m. start. we entered the park at 7:30 a.m. It was still dark. We were the first visitors for the day. We were really lucky because after the heavy rain last night we had a clear morning. I was surprised that the trail was completely paved and it was a shock to find it was mostly steep steps. We visited a few temples along the way as we slowly wound our way up and around the narrow gorge.We climbed for 10 hours finally reaching a temple at 5.00 p.m. and just in time for dinner. The Buddhists are all vegetarians so you can eat easy because you know there will be no surprises. We slept in the temple. The room was very basic and cold. But we did all have electric blankets which was nice because up at 2400 metres it was cold. 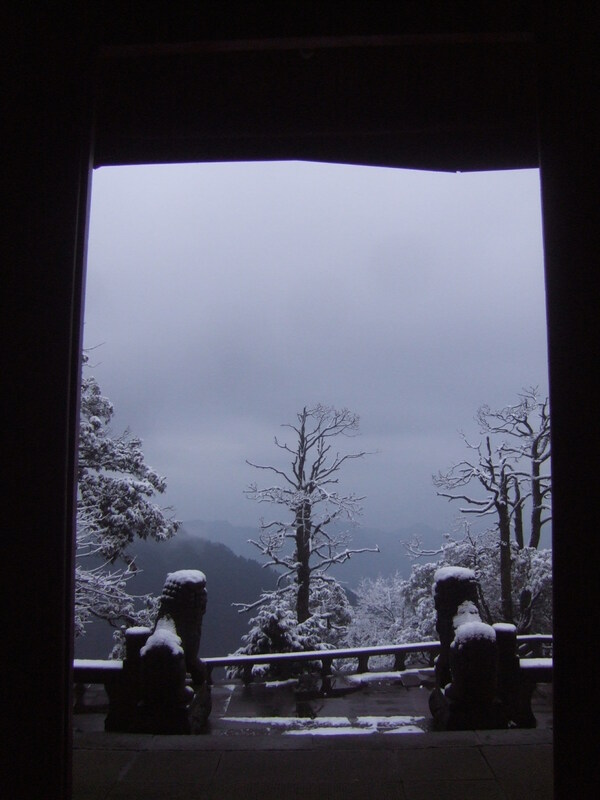 Day 244: We woke up to the sound of drums and chimes in the temple and to find that it had snowed overnight. After breakfast we started to trek in the snow. It was very misty and cold. After 3 hours we reached the cable car. Two of the girls caught the cable car which takes 4 minutes to get to the top and Kawi and I continued trekking for another two hours. As we got close to the top we climbed up out of the cloud into bright sunshine. When we reached the top we were above the cloud. The Chinese call it the sea cloud. The views were terrific you could see for miles and in the distance you could see the peaks of mountains sticking out of the cloud. I said goodbye to the girls after lunch because I needed to get off the mountain and back to my bike and moving again. 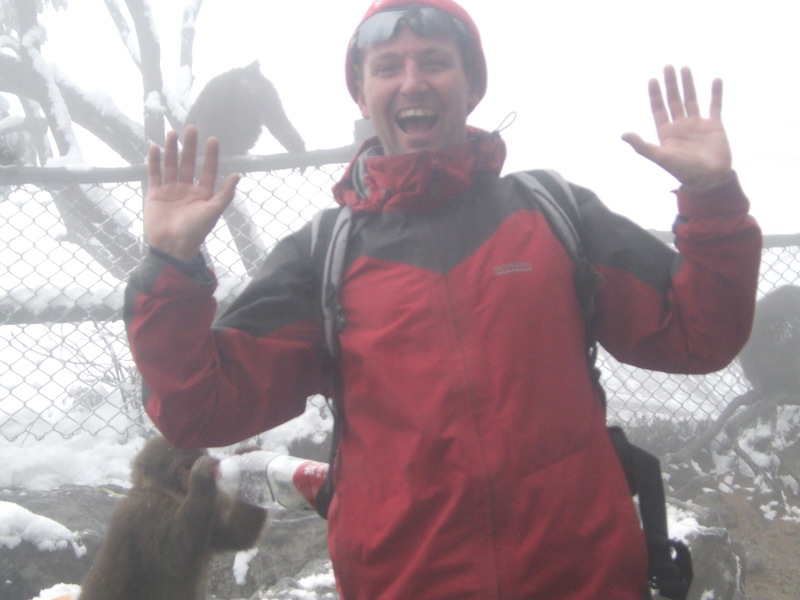 I jumped on the 4 min cable car and then while walking down to the bus station I was ambushed by some monkeys. One grabbed my water bottle from beside my pack. I grabbed it back off him…but when he started to chase me I decided to give it back to him. After escaping the monkeys I took the bus back down the mountain…………..I had a message for me at the hostel from a French guy who had seen my bike and who I had met in Chengdu. He wanted to know if I wanted to cycle with him to Kun Ming. I wasn’t going to because I am really pushed for time. Even more so now because I took time out to climb the mountain. Not for the first time in the morning I found myself a little lethargic and it didn’t take much for me to decide to stay another day. Sebastian and his girlfriend came round to the hostel for dinner. We made a 9 day plan to get to Kun Ming. We are both in a hurry because I have to get the visa for Vietnam and they needed the visa for Laos. Sebastian’s girlfriend is going to catch the train. Just after 8 a.m. Sebastian said goodbye to his girlfriend and we set off. It was very hilly and tough going. 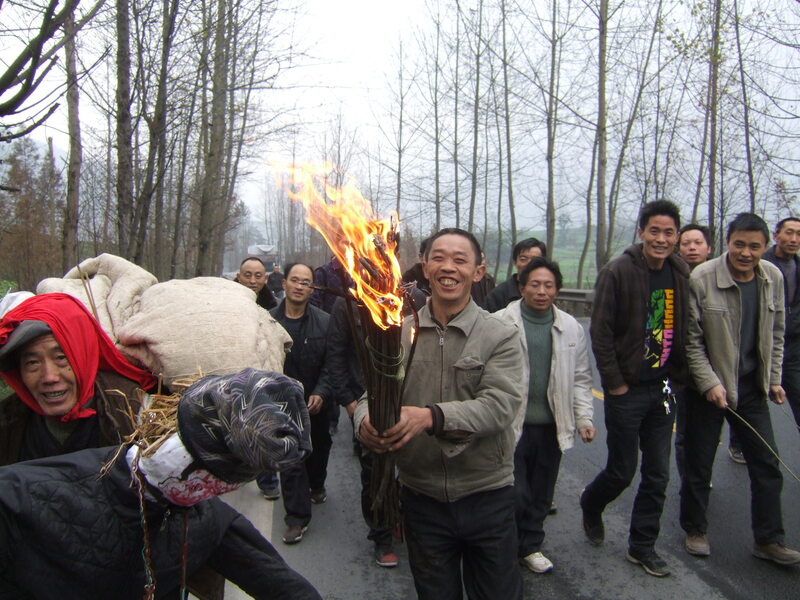 We passed a crowd of locals letting off fireworks and carrying a burning torch and a scarecrow which they were going to burn………….in what I guess was part of a ceremony to ensure good crops for the coming year. Spending the morning climbing really slowed us down. Come 2 p.m. we finally stopped for a late lunch but had only done 60 km. We left the 306 and turned off for the smaller X149 road which wound through a gorge. One of the things that slowed us down in the morning was I had another bloody puncture to repair. Not long after lunch I had yet another puncture. This time I just pumped the tyre up and pushed on………..we really need to do at least 100 km a day if we are going to get to Kun Ming in time. But after a few kms I really needed to get it fixed so I pulled into a garage and got them to do it for 0.50p. That stop may have cost us dearly because just a few kms further the road was completely blocked. We ended up having to wait 2 hours while they cleared the road along with an old guy. By the time we got going it was nearly dark. We were only able to push on for a few kms till we could find a very basic patch of ground right next to the road to pitch the tent………….at least we had the metal barrier to protect us. If yesterday was a tough cycling day………….today was even tougher. We packed up in the dark. Trying to make up for lost time. We started to climb steeply up the gorge. Every few kms was a dam and power station. 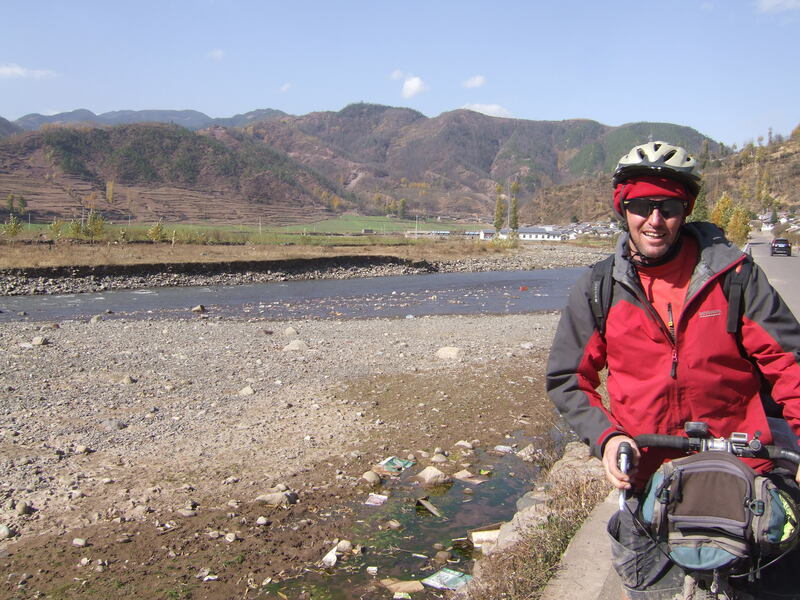 We eventually left the sealed road and swapped it for a muddy dirt road and we started to cycle through Dafengding National Park. The park sign said home of giant pandas, red pandas, black bears and leopards……Despite the terrible road it was nice winding through the forest. As we got higher we went above the snow line. It was difficult trying to find somewhere to camp on the side of the mountain. But when we did it was in snow. It was -3 degrees when we stopped. I just put the tent up and went straight to bed………….I was lucky because Sebastian cooked us some dinner. After two days it is not looking good because for the second day in a row we failed to meet our 100 km target……we are now 45 km behind. It was bloody freezing in the morning. The frost was so big that even after I had taken the tent poles out the tent still stayed upright. I had wet socks and shoes from the day before and it was most unpleasant putting them back on this morning…………but I couldn’t justify wasting a clean pair of socks. On the dirty misty, muddy road the 3 km was slow going to the top. At the top there was more snow and lots of ice and it was -3 degrees. Descending down the other side of the pass the weather was a lot clearer. After a few hours we got down the mountain and it was nice to get back on to a sealed road and to see a few villages. In one village it was market day which was very lively and interesting to pass through. 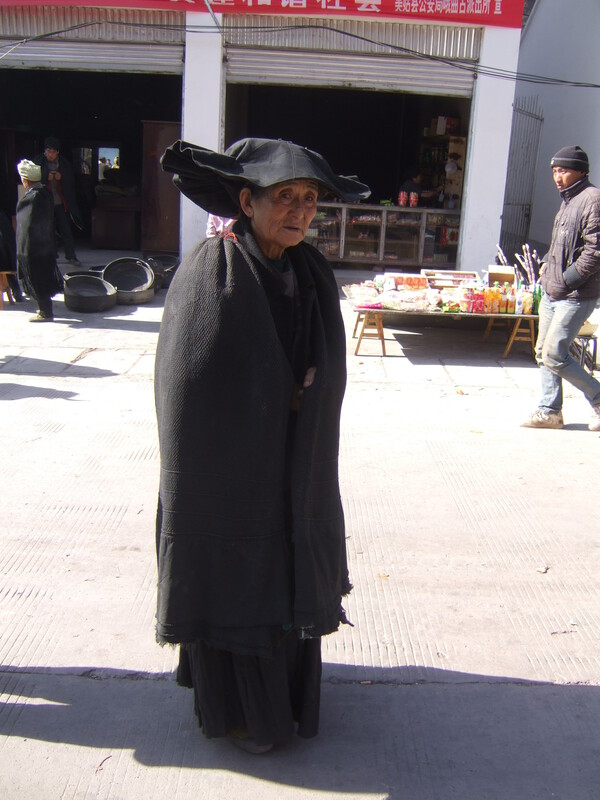 The people were in traditional dress and the older women had these huge hats. After some really tough days we were resigned to the fact that we were probably going to have to get the train at some stage to make our deadline………..Megiu was a fairly large town…………and after some tough days a hotel was a nice option. It was very basic. But the water was hot………….and I needed a good clean after a couple of days in the mud. Meigu was on top of a hill and we were lucky to have some young kids help push us and our bikes up the hill. 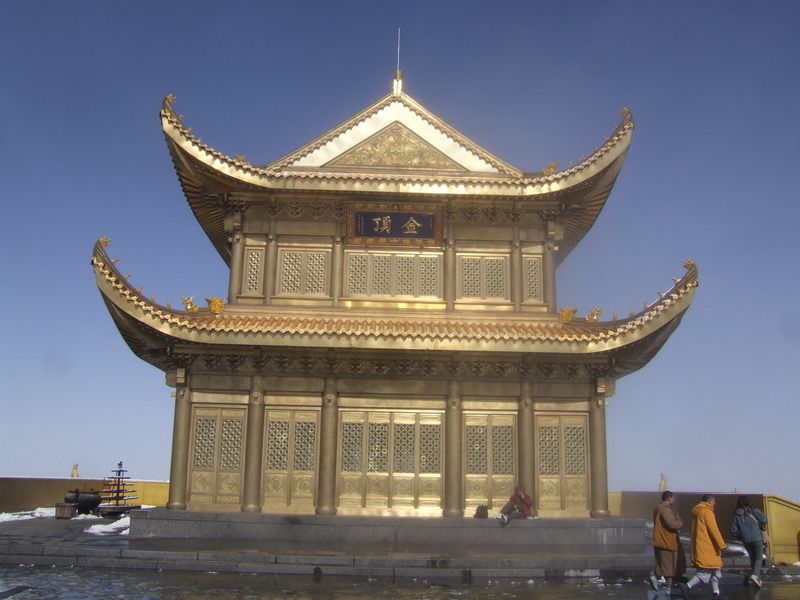 In the evening there was about a group of 40 women doing some form of Chinese line dancing in the square………….when they spotted me I was asked to join……….but quickly declined. Sick of another day of wet socks and cold feet I utilized the electric blanket on the spare bed by putting my towel, socks and damp clothes on to dry. I caused some panic in the hotel because after checking in and while they were entering my details into the computer they discovered my visa had expired…………they were panicking big time when they thought they had an illegal guest staying. Calm was restored when I showed them my visa extension. We had a good day cycling as things go…………started with 50 km downhill winding beside the river. Followed by a steep 50 km uphill through another narrow gorge. At 99 km we pulled the pin and found a nice grassy bit to camp on above the road. 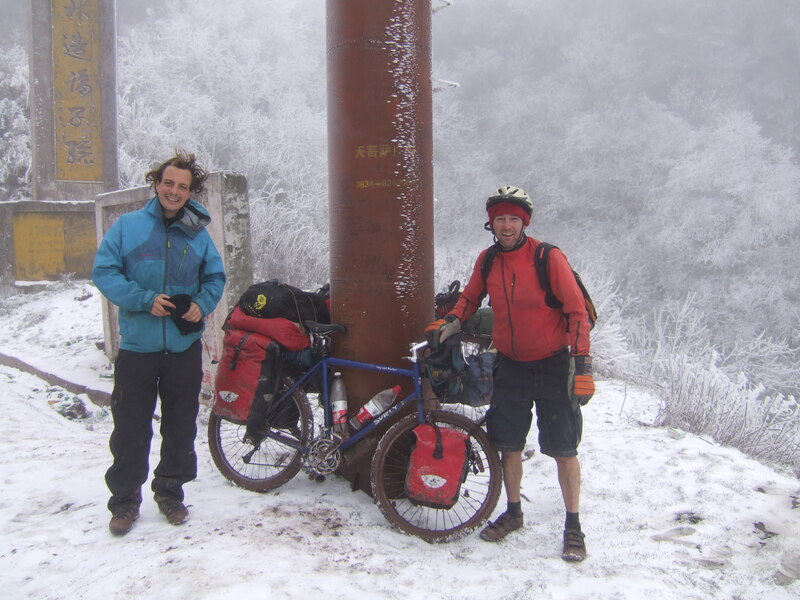 It was a bit of an effort getting the bikes and all our gear up there. It was a nice clear evening……………but this meant it was cold, -4 to be precise. Sebastian’s knees are giving him problems and he told me he is going to get the train in the next big city. I have said I will cycle on and if I have to will hitch to Kun Ming on Sunday. But I don’t really want to. It was bloody cold in the morning again………….a little touch of snow and freezing fog. It was -3 when we set off. It was nice that we only had a short uphill. There was a small village so I waited for Sebastian in a shop by a nice fire………..it’s just to cold to be hanging around outside for too long. You cool down so quick. 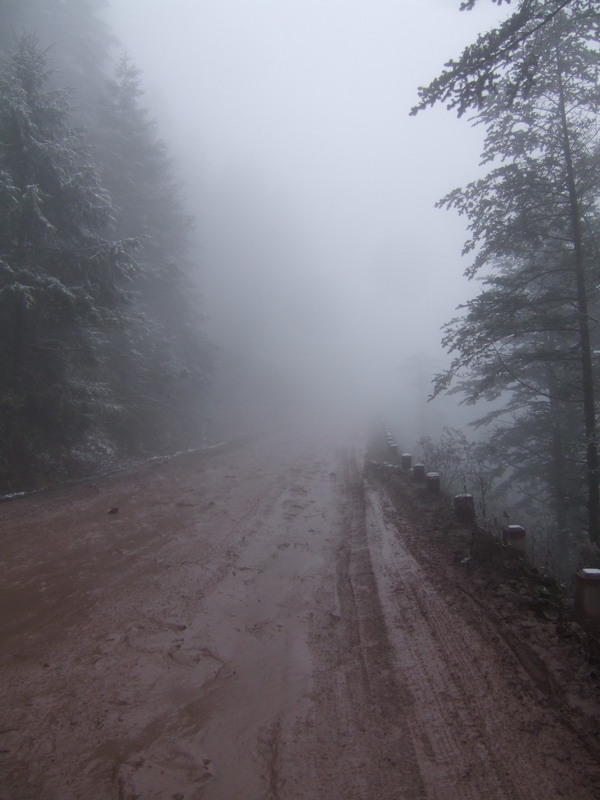 We then had a short downhill followed by a longer uphill where we climbed up through the cloud………..The top was freezing so I just kept pushing on. Coming down the other side was nice and clear. 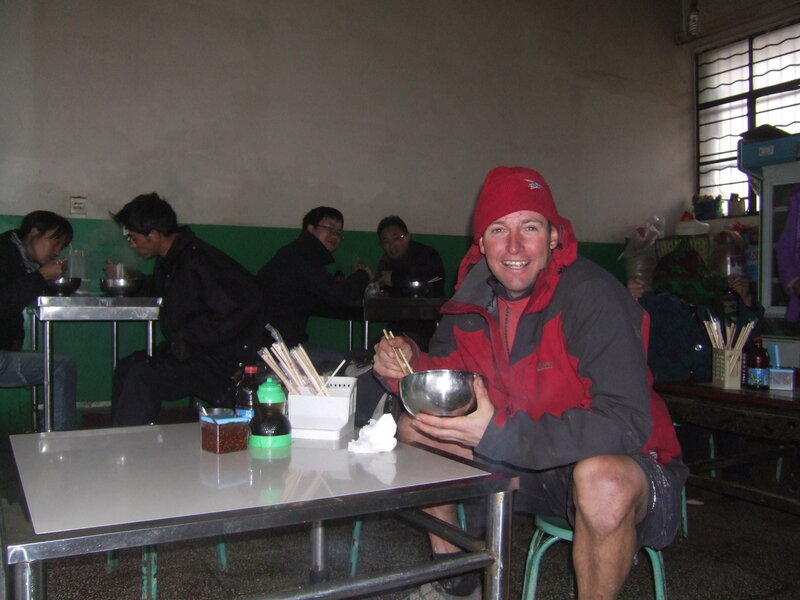 Few kms over the pass I stopped at a Tahitian restaurant…………..it was freezing. No fire and all the doors were open………..at least I got a hot cup of tea while I waited. 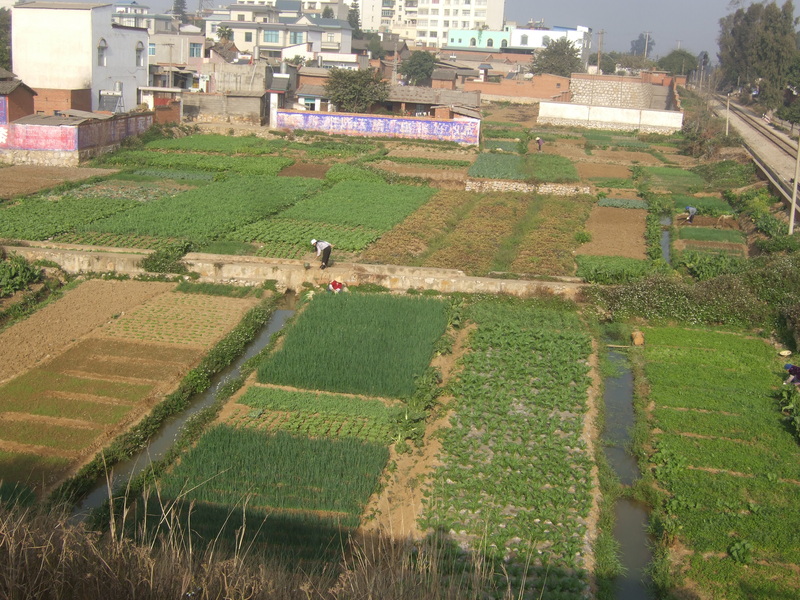 We got to Xichang just before 3 p.m. I said goodbye to Sebastian who was heading straight to the train station and I headed straight for a hotel. It was a nice hotel and they let me put my bike in the room. They had internet which was good until my adapter blew up when I plugged it in. I now have the problem of not being able to charge my computer any more. The great thing about being in a city that never has foreign tourists is that when you go to buy something you pay the real local price. I bought 4 bananas and a kilo of fresh mandarins for less than a pound. For dinner I had beef, rice and vegetables for a pound as well. It’s nice not getting ripped off. I am on my own again after Sebastian caught the train yesterday. I have 588 km to Kun Ming and now only 4 days after it took us 5 days to do just 400 km We should have really done it in 4. I was determined to crack on today. I started with a good hotel breakfast. It started to rain….which was all I needed and I thought about staying another night. But at 9 a.m. I decided just to go for it………………..10km down the road I had another bloody flat tyre………70% of my flat tyres have now been in China. The 108 was a good road and the fact it was heading down river was nice as well and enabled me to make good progress. Mid-afternoon I came across a traffic jam………….I just wheeled past the trucks and cars on my bike. When I got up to the front, the penny dropped………….$%^^…………$$%%$ . There was a large crowd gathered and I saw a bus all smashed in after colliding with a motorbike and in the middle of the road was a body with two women wailing over it. I jumped off my bike and looking straight ahead quickly pushed my bike past. I felt sick and a little shaken. After 100 km the road deteriorated and left the river heading up. 118 km I got yet another bloody puncture………..I fixed it and cycled only another 2 km before stopping at a shop for a drink. Just before I was to leave I asked the young girl if it would be ok to camp in the field next door. She asked her grandparents who thankfully said this was ok because it was getting dark and I was tired. 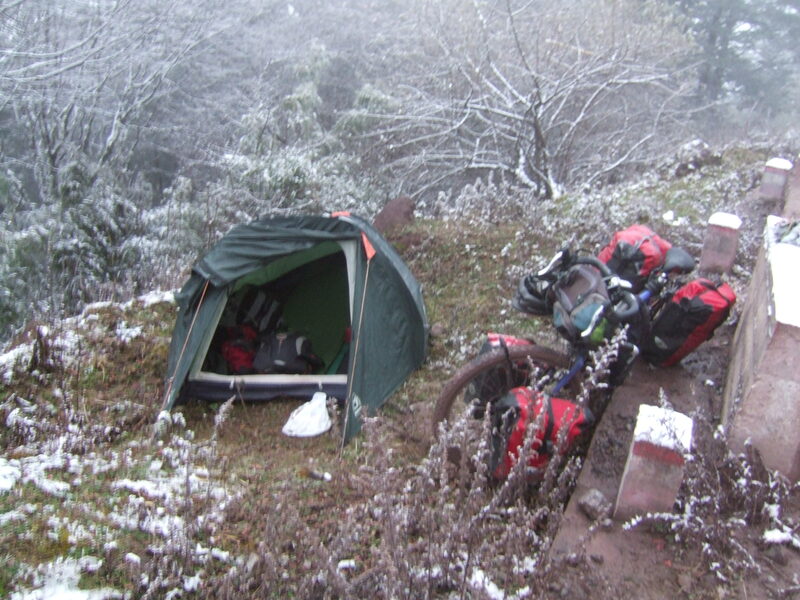 I put my tent up, wrote in my diary and then went to bed………..about an hour later the father came home and got me to take the tent down…….put my bike in the garage and come into the house…….They had a bed at the back of the shop for me to sleep in. They brought me some hot water to wash and gave me some noodles from the shop………..The toilet was a real long drop out the back and in the toilet was a pen with a massive pig. No one seems to get up early in China. It was 7:45 a.m. before anyone stirred in the house……………I had been awake and rearing to go since 6:30 a.m………..but I couldn’t leave because my bike was locked in the garage……………When the grandmother got up, I got her to unlock the garage………….I declined breakfest and I was on my way………..but not at the pace I wanted. I found myself slowly winding up the hills for 3 hours and only going 30 km. I then left the 108 by mistake………must have missed the turn off and found myself on the S213 which turned out to be a much better road. The scenary was very nice as I went up and down the rolling hills……………..I don’t mind 5 km up and then 5 km down at a time. It is nice riding. Bit of hard work followed by a nice rest on the way down. Come 17:30 I came across a rough looking town……….but at least of a decent size to have a hotel of some sorts………a room with 3 single beds. A TV………….But no shower or toilet or any heating. It was only £1. I went out and got another 0.40p shave and some really cheap fresh fruit..
Day 253: Togan – Don’t Know Where ? This morning I very quickly left the rolling hills and started to wind around a high mountain before a sharp descent to cross the river. It was raining a bit this morning and bitterly cold. After crossing the river I spent a long 4 hours climbing up and up and up into the freezing fog. 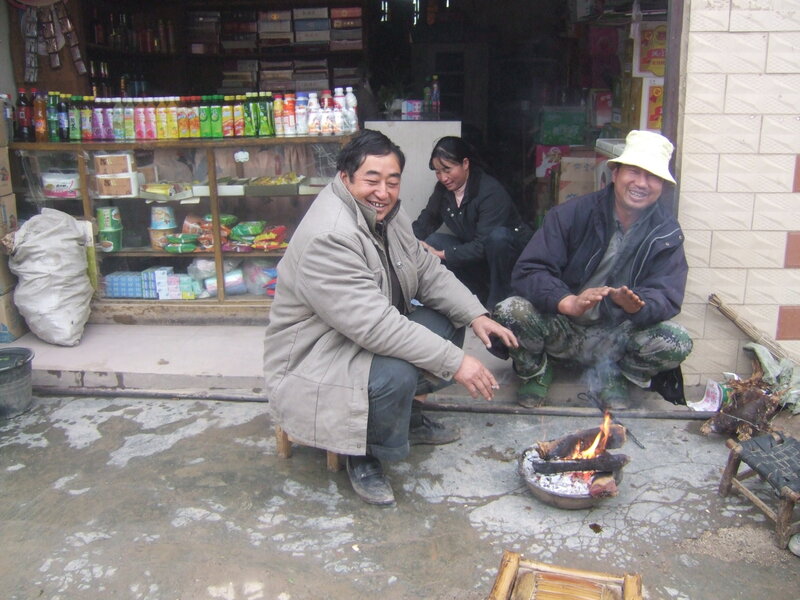 The locals are always so kind and always invite me to join them around their open fires they have burning outside their shop or house. Just before the top of the pass I was surprised to see a church. 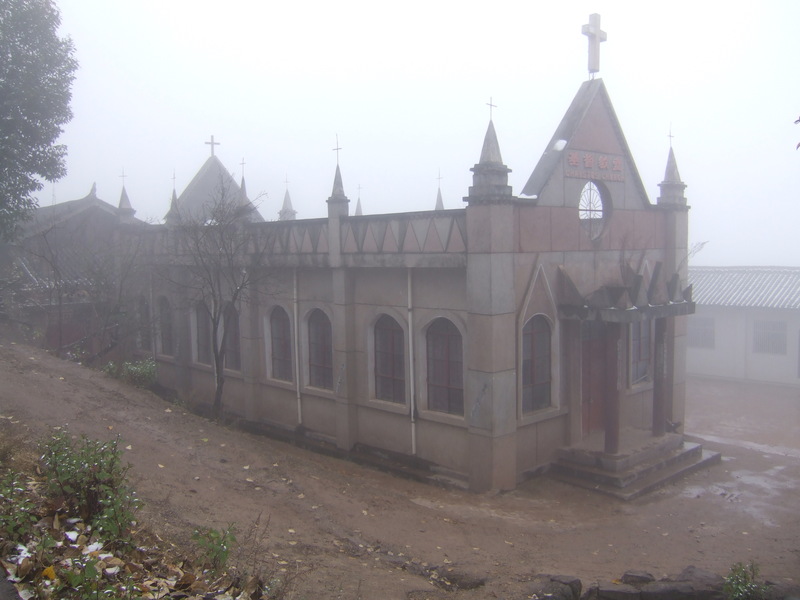 This part of China must be very Christian because in the same day I saw another 4 churches. Right on top of the pass was snow and a small town.It was market day. I bought 4 muffins for 0.20p and then enjoyed a nice descent. The road is being rebuilt…………so parts of it were very nice to cycle. New parts of the highway cut straight through the countryside, with large parts of hills removed to make way for the road. Right at the end of the day I was lucky to find a small town with a £3 hotel. It was above a bar and I got to listen to very bad Chinese karoke. They can not sing in tune and just scream as loud as they can. When I set out this morning I didn’t think it would have been anywhere near as long a day as it was. After acquiring some local information the night before I was told it was 170 km to Kun Ming and was resigned to the fact I wasn’t going to make Kun Ming in time and would need an extra day with the thought of two smaller cycling days ahead. I only cycled 1 km down the road before stopping at a small restaurant for some noodle soup. It was freezing cold. It had snowed over night and was now very misty. I made the decision I would go for it and I did. I dug deep and lifted the pace. Sadly the favorable road conditions were gone. The new highway finished and I rejoined the very hilly and broken old 108. Come 6 p.m. it was starting to get dark and I was only 15 km away. I was determined to make it that night. I put all my lights on and only for the third time I cycled in the dark/pitch black. 3 km from Kun Ming I had to cycle through a 2.5 km tunnel which just seemed to go on forever and ever. Just after 7 p.m. 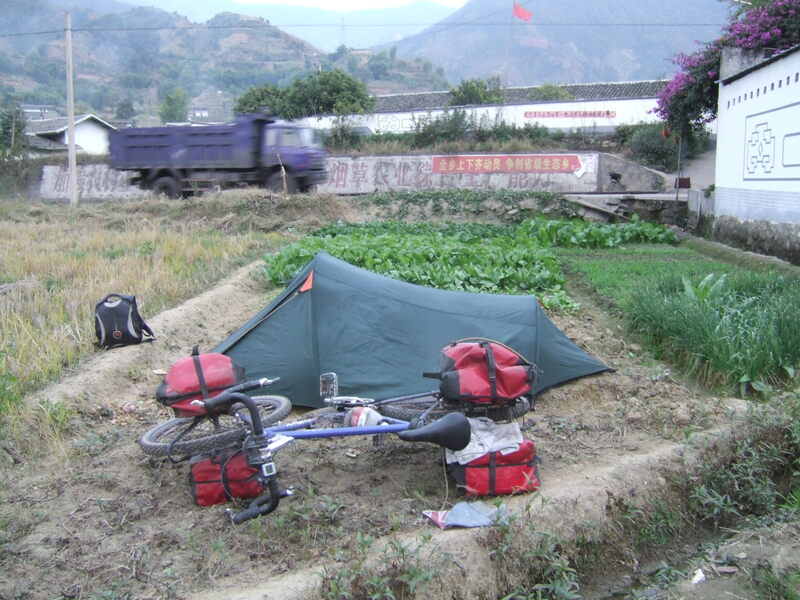 I arrived on the outskirts of Kun Ming which was a bigger city then I thought because it took another 10 km to cycle into the centre and two hours in total to find the hostel. When I arrived at 9 p.m. I was very thankful……..but exhausted. Off to the Vietnam Embassy first thing tomorrow and then looking forward to a few days’ rest. I forgot to mention yesterday I passed the milestone of 15,000 km. Maybe another 9,000 km to go. I’m on the homeward stretch. First thing today was a visit to the Vietnam Embassy. Pretty simple………pay 385 Yuan and come back 3 days later. I still haven’t been to McDonald’s. But I did visit KFC as a treat………………….a treat I repeated at least another 3 times as well as daily trips to the bakery for lots of yummy cakes. About 10 days ago I lost a filling while eating a chocolate biscuit. It was a bit of a worry finding somewhere decent to get it fixed. 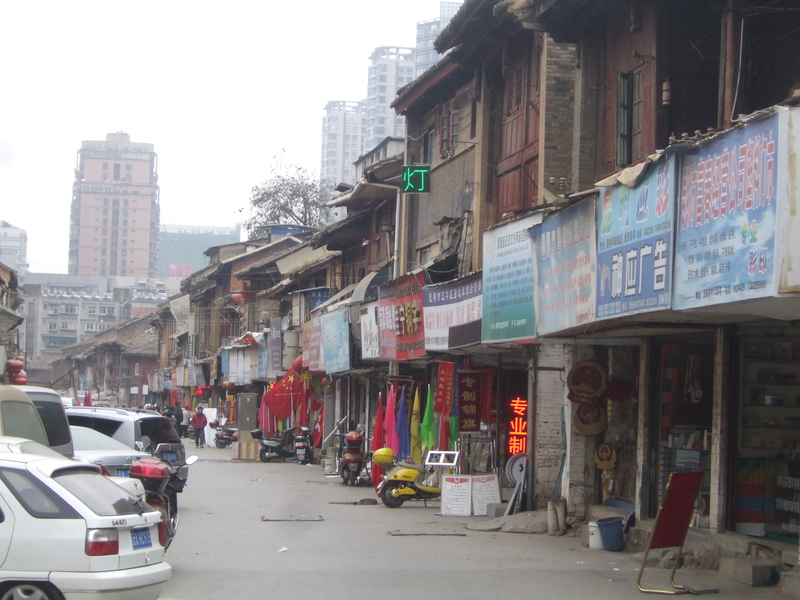 Kun Ming was the first real big town to get it fixed. Luckily, I was recommended a good English-speaking dentist. I rang them up and was in two hours later. The surgery was very modern. More modern than my NHS dentist back in London. It was a bit touch and go. There was talk I might need a crown because the filling was so big. In the end I got a white filling for £40.00. The X-ray was £1.50 and the injection £2.00. I went back the next day for a very good clean. In fact the best clean I have ever had. My Chinese dental experience didn’t turn out to be a bad experience at all. 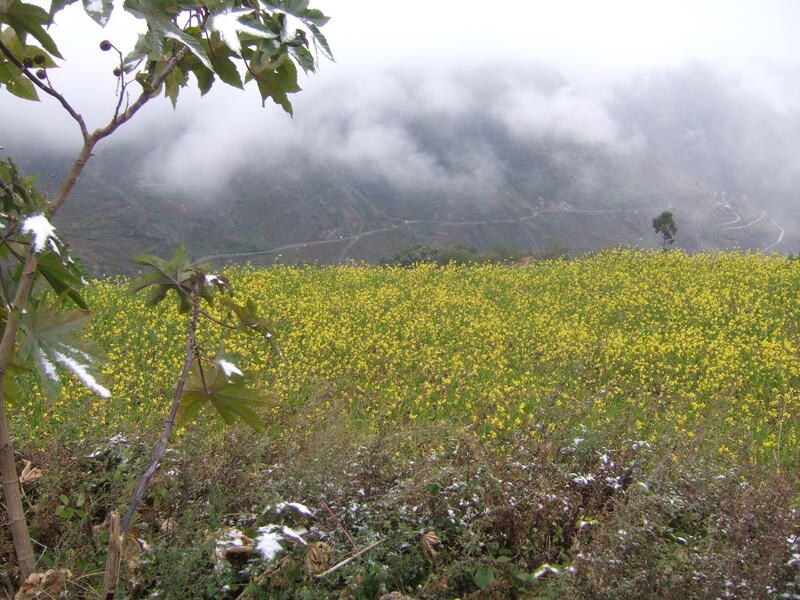 There is not a lot to do in Kun Ming. That didn’t bother me because I was quite happy to do as little as possible………..in just under a week the only touristic thing I did was walk around The Green Lake park, which was full of people feeding seagulls, exercising and just relaxing. The park was full of many small ponds. Day 260: Not for the first time I was a bit naughty today. I had the bike all loaded and ready to go for a 5-day 500 km ride to the Vietnam border. I will have to do it in 4 days now because after sitting down for some breakfast and chatting to a few people I lost momentum and found myself checking back in for another night. Yay…….I finally got away this morning. The bike was already loaded from the false start yesterday. I just got up had a hot chocolate and I was good to go. My feet have been starting to hurt quite a bit lately…………they haven’t been the same since they froze while cycling through the snow. Being a Sunday it was a good quiet day to be cycling out of the city. I still got a little lost trying to find the G324……….my GPS told me I had crossed it. I think it had become an expressway but it just wasn’t there. An English-speaking local sent me in the right direction and I finally found the G324. Again I got lost missing the turn-off for the G326 and having to back track 6 km……………by the time I got back to the turn-off it was getting late. I stopped in a restaurant for some egg fried rice. 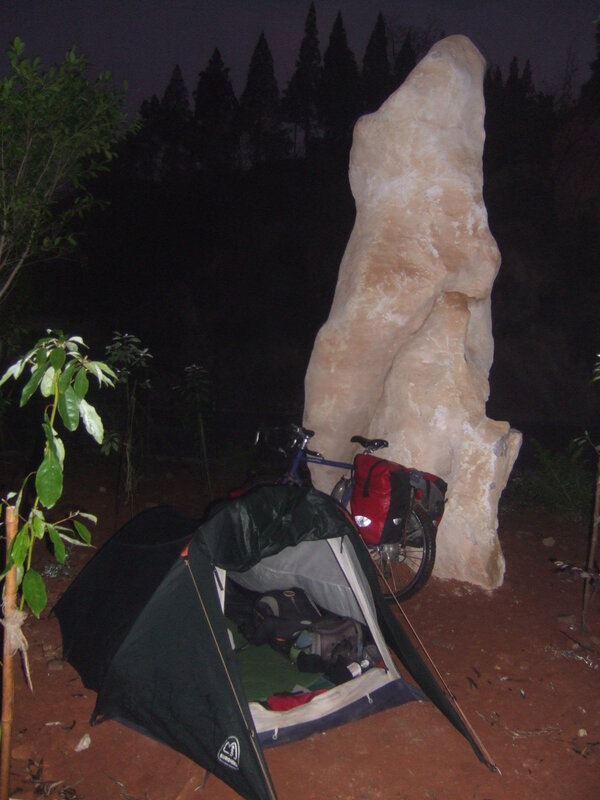 Afterwards I pushed my bike only 500 metres till I found the first suitable camping spot on the corner of the street among some baby fruit trees and next to a stone monument and just 25 metres from a water- filling station. There were a few people around………….no one came and bothered me…….only a dog that barked for a while and then gave up after he realized I wasn’t taking any notice of him. My feet were aching again in the night. I’m getting a bit worried and decided I was going to return to Kun Ming so I could go to the hospital. I packed everything up and in a split second I changed my mind and decided to keep heading for Vietnam……………I will go to the hospital in Kaiyaun or when I get to the border. My visa runs out on Thursday so I can’t really afford to go back. It was a very misty morning. 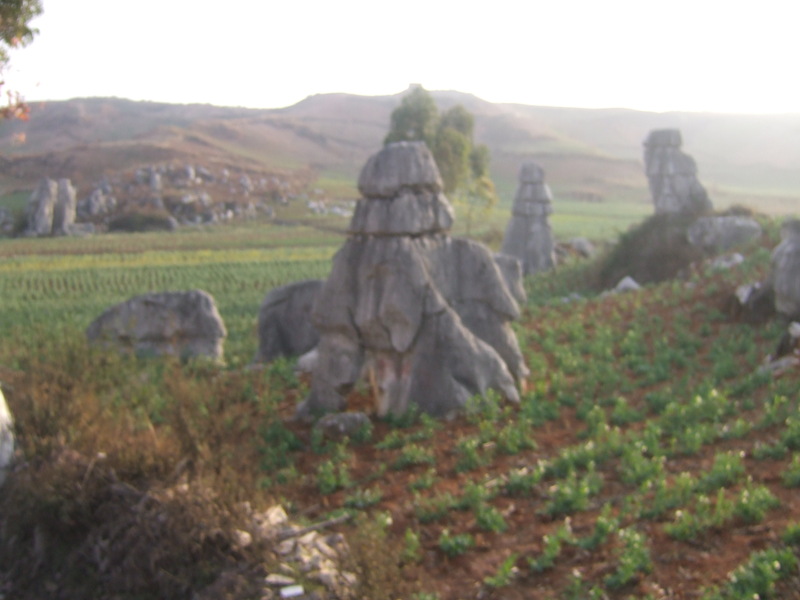 The cycling day started by cycling up through the outskirts of the stone forest. Lots of large free standing stones. The weather was constantly changing. When the sun was out it was hot and I even got sunburnt. But when the sun was hiding it was bitterly cold. I followed the old road for most of the day which ran close to the new highway till the old road disappeared and I joined the highway. Wasn’t much fun with no hard shoulder and lots of trucks. I ended up falling 10 km short of Kaiyuan. Stopped at a restaurant for a feed and then discovered they had rooms for £1 so decided to stay. The shower was hot and the old style toilet was out the back with the chickens and the pigs. My feet were still hurting and starting to worry me even more. I couldn’t sleep again and all the scary thoughts of imagining all the worst scenarios like losing a toe……………………my toes on my right foot are all numb and a sharp pain keeps coming and going. It’s horrible just not knowing what is wrong with you. I haven’t made too many bad decisions on this trip. But cycling on yesterday was one of them…………….I should have gone back to Kun Ming yesterday. Last night I decided I was definitely going back to Kun Ming to get my feet cheeked out. I told the restaurant owner I wanted to go back to Kun Ming and he said there would be a bus. I was lucky because 10 minutes later the bus arrived and there was room for the bike for the 4 hour journey back to Kun Ming. The Southern bus station was 20 km from the centre of the city so when I got back to Kun Ming It took me another hour to cycle back to the hostel. I checked back into Cloudland……..quite a few people were surprised to see me. 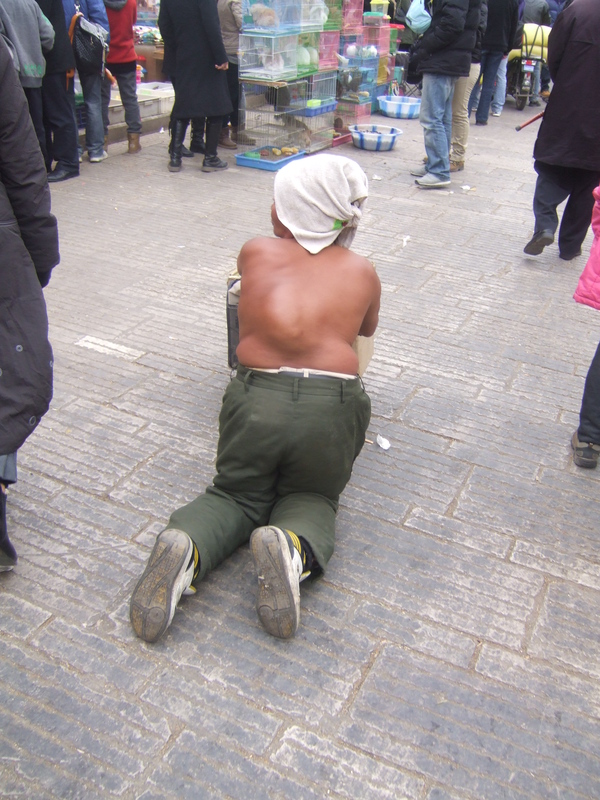 Then a Chinese girl Anna who I met before kindly took me to the hospital…………..It wasn’t too bad. We started off at the emergency room for assessment and then went to see a specialist. 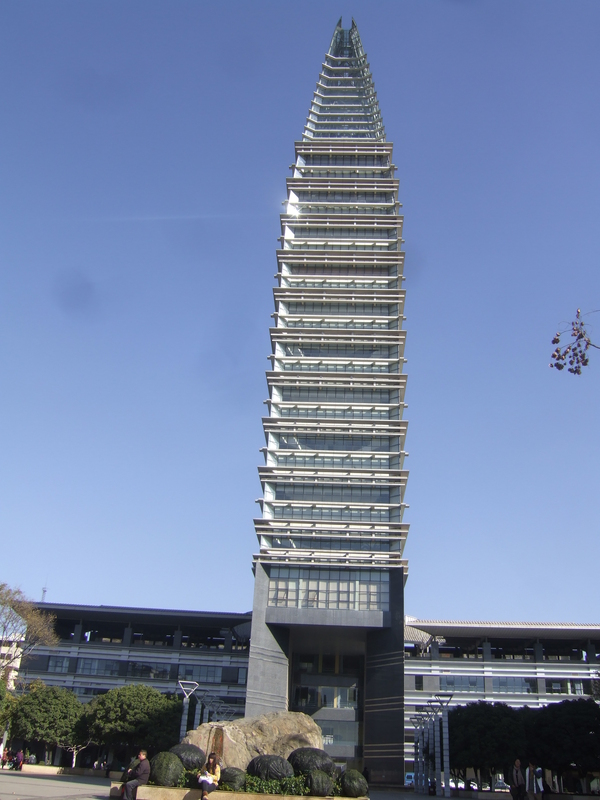 Then we got an appointment for 8 am the next morning for a scan…………..the initial word mentioned was thrombosis.I went back to the hostel still in no mans land and to take it easy. Day 264,265,266, 267, Christmas Day, 269, 270 &271 Kun Ming special rest days. .On the way back from the PSB I saw a Mc Donald’s and couldn’t help but go in. I spent a fortune today in the English book store on the Lonely Planet for Vietnam and Cambodia. As well as road maps for Vietnam, Cambodia and Thailand. All would have been cheaper to buy in London. In the evening I was playing a bit of Ping Pong when a Swiss girl Regula turned up and she was just surprised to see me again as I was to see her. She had just been to Carrefour and kindly invited me for some Swiss cheese, salami and Baguette. It was a very nice treat. Day265 I spent the day with Regula. We walked up through the trendy part of town and did a bit of tent hunting……………..I let Regula do the Bartering…………she did well……………but we couldn’t quite get the price………Down below £55 from £70. I’m not keen to pay to much for a tent because I really don’t trust the quality……and can see it falling to bits in a few weeks. Nothing here is what it seams…………..everything is fake. After a good few hours of walking…………probably not the best for my feet at present we ended up and Carrefour for some more Swiss and New Zealand Cheese, salami, Bargettes and a nice bottle of wine. A lot of choclate bars must go missing in Carrefour becouse they put them in a security box. Day266 I wondered Kun Ming with juni from Germany. We walked through the Green Park Lake, Through the University with its old stone and brick buildings. We Found a very nice local restaurant for lunch. 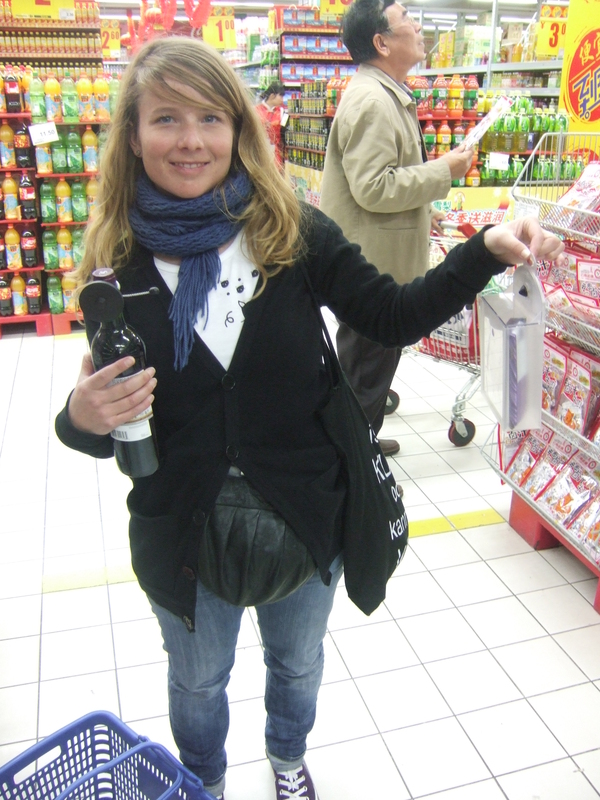 We ended back at Carrefour for some more New Zealand Cheese, New Zealand butter Salami, Bargettes and a bottle of wine. Day267 Christmas eve………………After tent shopping with little luck. I gave my tent a good over haul. I fixed the zip. Washed the tent and repaired the poles. I will hopefully get a few more months use. I was a little worried with no zip that I couldn’t keep out snakes or any other unwanted guests. I then went out to get a shave which turned out to be impossible……………nobody wanted to shave me. Gave up on that and went back to Carrefour for more cheese, salami , bread and gukens. 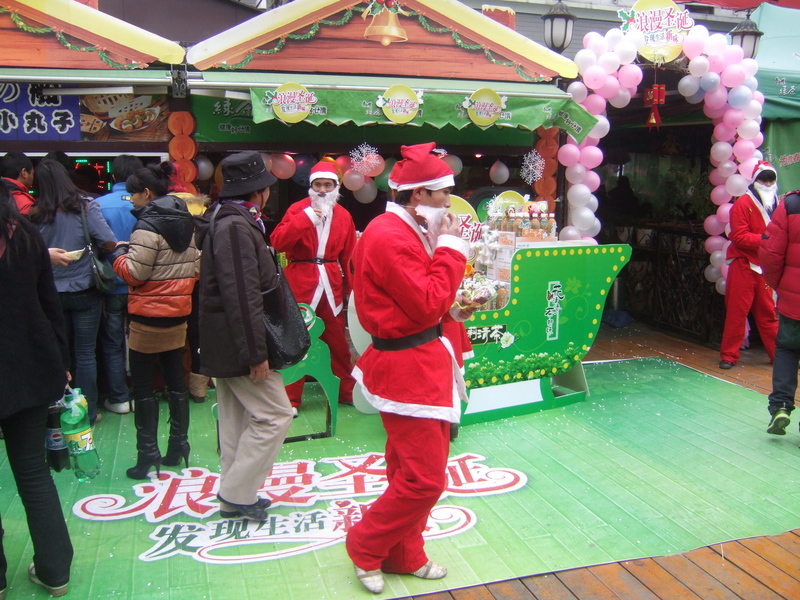 Saturday shopping in China was just like a real Christmas eve……..It was so busy. China doesn’t celebrate Christmas,,,,,,,,,,,but there has been a bit of Christmas feel because lots of shops have put up decorations and loads of people are walking around with Santa clues hats. The hostel had a Christmas party with a darts and Ping Pong competition and £4 drink as much as you can. It was actual a very nice evening. With a mixture of Forrian and local Chinese tourists…………………….afterwards I went out with a French group to the clubbing area of Kun Ming. It was the first time I actual really went out and probably just as well because it was really good and I would be keen to do it again. Which is a bit danger’s. It was really busy and awesome atmosphere with a bit of dancing………………but still been able to sit and chat…………..I got back to the hostel at 5am. Day268 Christmas day was very quiet. Got back at 5am and was up again at 8am for breakfast. Just can’t sleep once the sun comes up. was with very little happening apart from watching a few Dvds. Day269 As often happens I was just having breakfast when I meet a guy from Finland who was heading to the West of the city to Climb a mountain called XI Shan. So in a minute my day was planned. It took two busses to get there. We walked to the top via the road before entering the park. 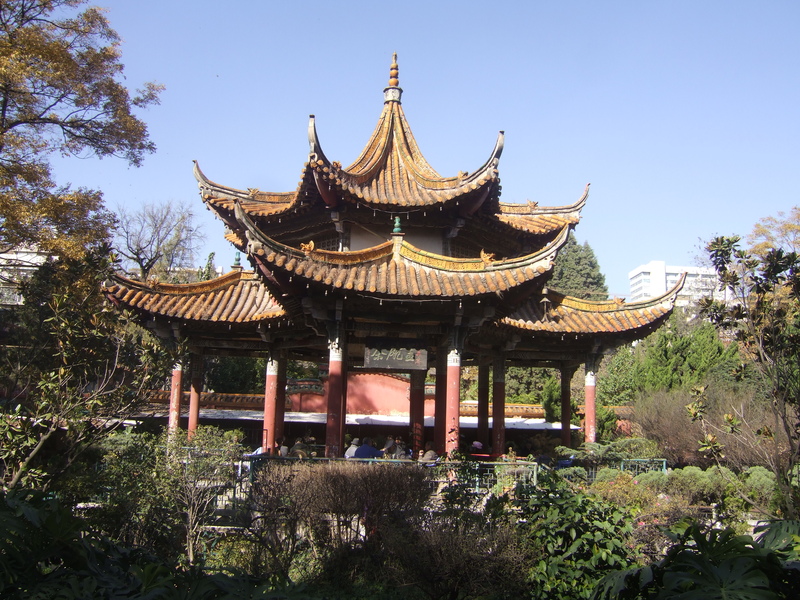 It was only a short walk to the top Pagoda with its panoramic view over the lake. We then descended through forest to the dragons gate temple which was reached by passing through a tunnel. Then after Dragons gate temple the trail was cutting into the cliff edge. Day270 I had a funny feeling this moving walking back from Carrefour. I felt like going to work…………I think I am getting a bit bored hanging around waiting for the visa extension. 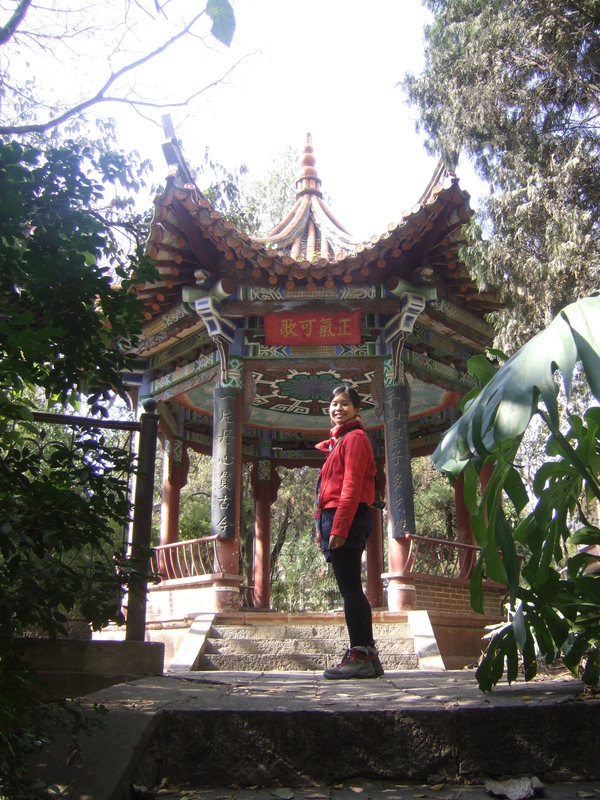 With the visa extension in hand I headed to Kaiyuan to pick up where I left off. Before I had to head back to Kun Ming. I was just going to get a taxi to take me to the bus station. But the bike wouldn’t fit in any taxis and no vans. So I had to cycle the 20km…………I got lost. It was difficult to find……..the most frusting thing is that you ask for directions and get sent one way and the next time you ask they send you back the way you came. After a few detour I finally made it. Buying the bus ticket and putting the bike on the bus was essay. 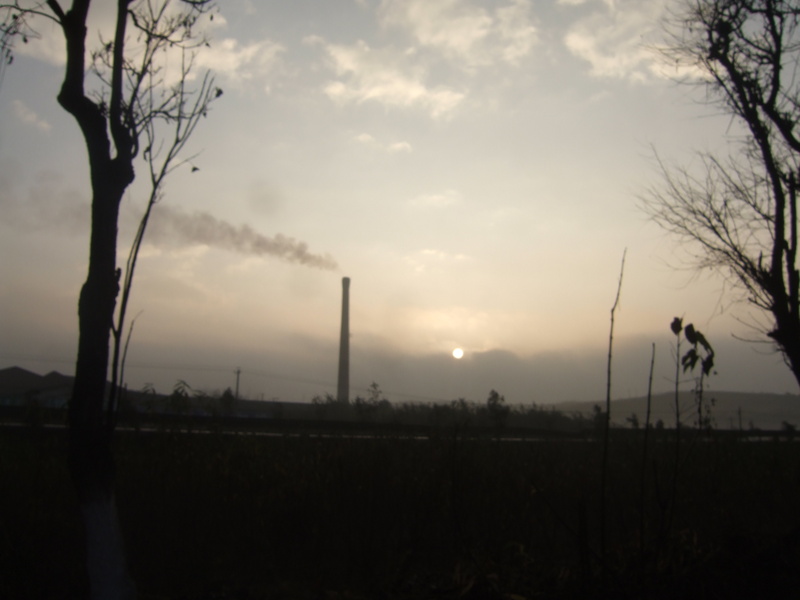 Entering Kaiyuan you pass a massive oil refinery pumping out smoke. The city it self very nice with both sides of the street lined with trees. I went into the back street full of food stores where you can eat so cheep.The hotel was right into Christmas with their dancing Santa Clues. After 3 months in China. I am getting closer and closer to Vietnam. The closer I get the warmer it is getting as well. I was back in shorts and a T shirt……….sunscreen was all so required. I heard it was all downhill to the border……….wrong I spent the morning climbing. Stopped for lunch in Gejiu………..often when ordering food you are disappointed with the result. This time I hit the jack pot………..I had a plate of Urbagine with garlic (Egg plant) , a plate of beef, spring onion with ginger and rice. durian lunch I discovered I stuck a little because both roads out of town were forbidden for cycles. One a motor way. The other a 2.3km tunnel. I took the tunnel. Cycling up to the toll gate……….I wave and said hello as I cycled past the barrier pleading ignorant for their calls to stop. Normal in tunnels I get off and push my bike along the footpath. This time the foot path had a large water pipe running along it. So I had to push along the road…………..this was slow. In the end I just cycled as quick as I could. Out the other side it was all down hill. With lots of rice terraces. 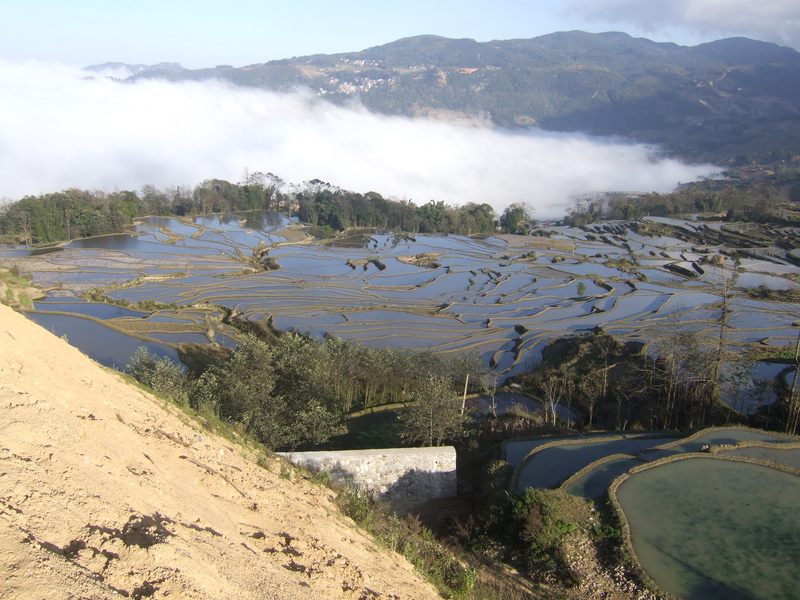 I got to the turn off for Yuangyang rice terraces. 14km so I thought id better go and have a look. It was a lovely sunny afternoon cycling beside the dam. 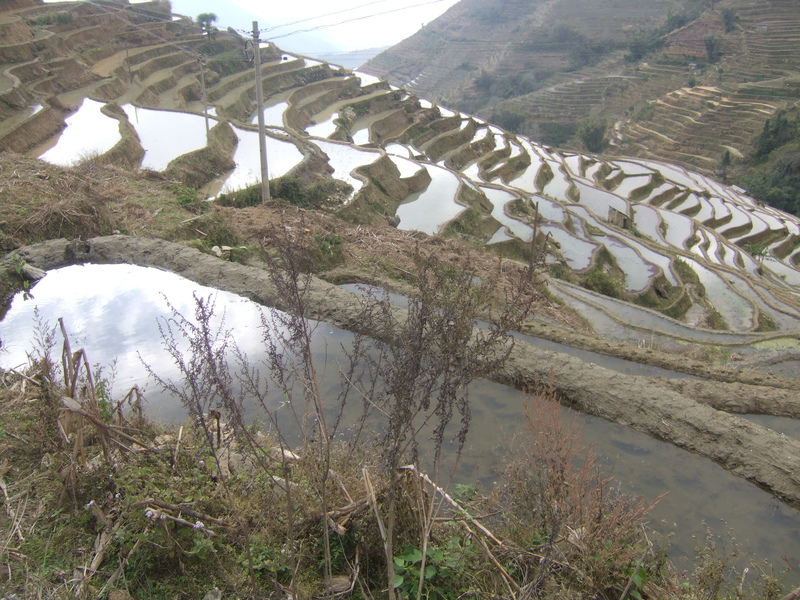 got to Yuangyang at 4pm and discovered the rice terraces were another 30km up the mountain. one hour bus ride. I was already knacked after doing 100km …………It took me 4 hours to wind my way up into the mountain………there was a nice view……the last hour i was cycling in the mist and dark. It was one very misty morning. You steep straight out of the hotel and into the damp. The market waqs opposite the hotel and I went for a bit of a wonder through. At the back of the market I had to have double take. 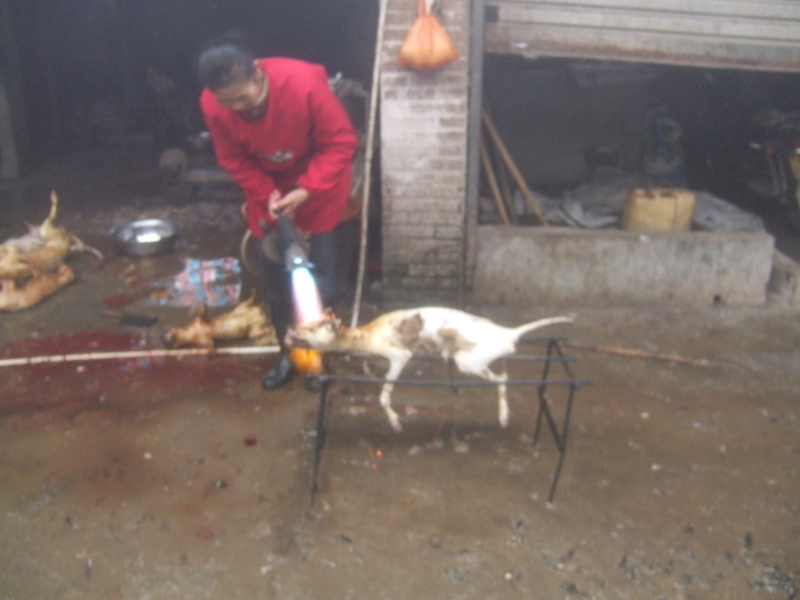 For the first time in China I saw dog meat for sale. The only other time I cycled through a small town near Kunming and saw a picture of a very happy looking dog next to a chicken out side a resturant and realised what it probly ment. I didn’t stop to find out either. Come lunch time it was still as misty as ever.but thought Id better get out and find these famous rice terraces. Tho I had heard stories of people waiting days for the mist to clear. I was told of two places 9km and 18km further up the mountian. 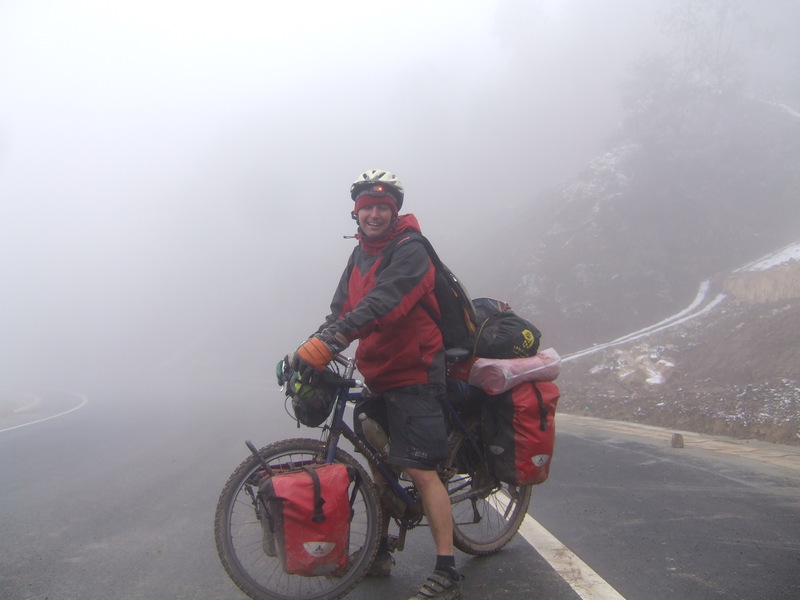 I cycled in the mist in zero visability finnaly cycling up out of the cloud into perfect sunshine. Getting above the cloud I could the rice terraces and the many pools of water. I thought to myself yesterday. How lucky I was to spend 3 months in China and not get sick,,,,,,,,Famous last words. Happy New year this morning I woke up as crock as a dog…….knowing I wouldn’t be cycling anywhere. I’ll spare you the details…………It’s been one uncomfortable day. A New Years to remember. But for all the wrong reasons. I have to leave the rice terraces tomorrow. No matter what…………I had just enough money for breakfast and lunch on the way to the border. Now half of that is gone for tonight’s accommodation……….There are no Atms here so I am a little stuck………..I have had to pull out my emergency food from my panniers to keep me going. I have been in bed all day and won’t leave the hostel………have been watching coverage of country’s such as New Zealand…………because they were first followed by Australia, Hong Kong, China, Moscow, London, Paris and New York welcoming in the New Year. When I finally got sick of 20 repeats I am thankful for my computer so I can watch a few movies instead. I was still feeling sick this morning…………but had no choice but to go because I was out of money. It was a very misty morning heading the 30km back down the mountain to Youngyang. Things didn’t start well just 6km I got a puncher and to make things even worse 10km further the Dogie Chinese inner tube completely split along the seam. Getting to Youngyang I went for the cash machine…………bloody thing wouldn’t work…………contact your back. That left me with 20 y (2£) for the 2 day trip to the border and with little food & water. After not eating for a day. I had plain pot noodles for breakfast and the rest of the day was a couple of mandarins and few biscuits. Late in the day I spent half my food ration on some boring egg fried rice and a drink. I was feeling very dehydrated. The 100km cycle along the river was very nice and some of the best scenery I have seen on this trip. The river had been dammed and on the opposite side you could see the old road disappear into the water and crops right to the water’s edge. I cycled right up to 15 mins before sunset and looked for a road or path to get me down to the river. I found a dirt road that lead to a overgrown track. I followed it and it opened up into a small clearing next to the river which was perfect. On the other side of the river was a small village. Not long after setting up camp a boat from the other side started coming towards me. Just as the boat docked next to my tent half a dozen locals turned up for the return trip. I didn’t sleep very well. I could hear noises in the bush close to the tent. Some small animal I think. 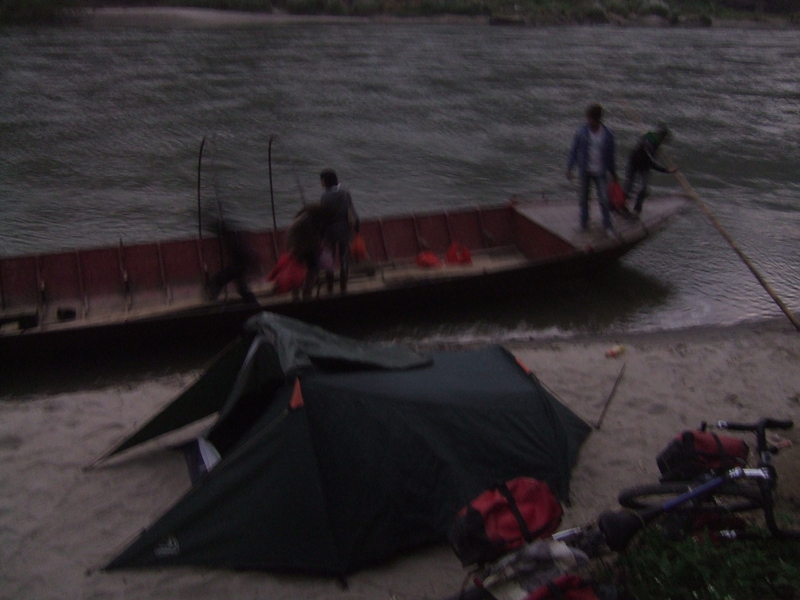 Then at 4am There were people on the other side of the river coming across in their boat……..shining their torch looking for the landing spot. It was all a bit odd. One guy stayed with the boat while the other went off for about 15 min, came back and they left in their boat again. They completely ignored me and didn’t give me any trouble. It was raining in the morning so I wasn’t in a hurry to move. Around 8am I got some more visitors when the local ferry boat arrived with a group of locals. From lying in my tent I said hello to their amusement. 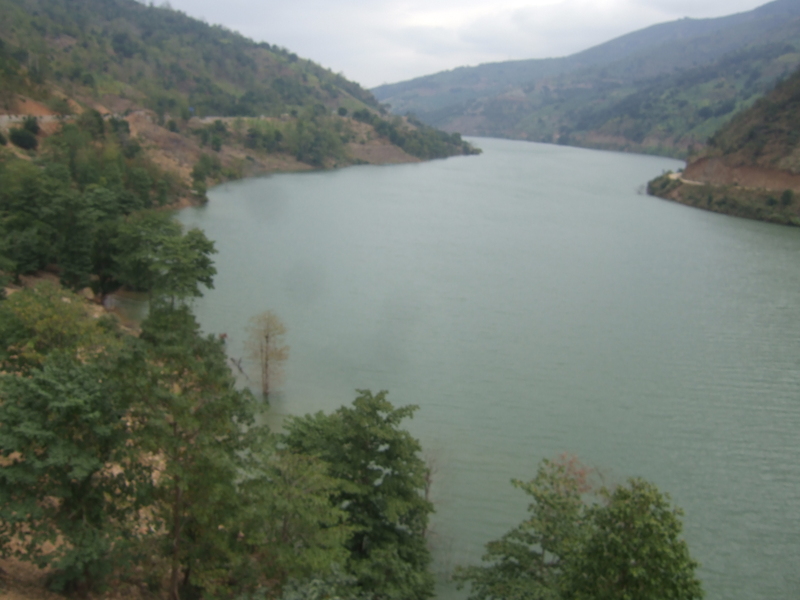 Cycling for another 70km along the river and border with Vietnam was beautiful scenery. 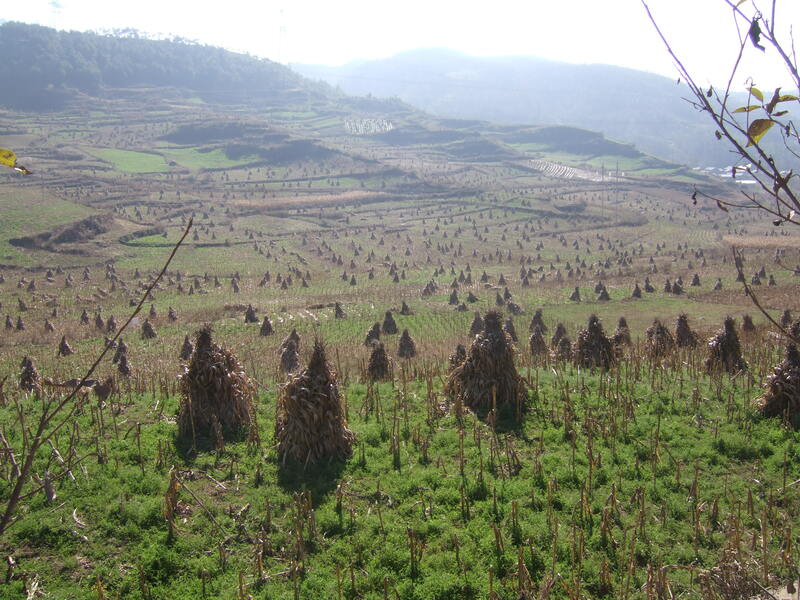 Lots of small villages surrounded by Pineapple, Banana and Mango plantations. When I finally got to Hekou I went straight to the border after spending my last 10y (1£). After 5000km spanning 5 calendar months China is finally over. I will leave China not seeing Beijing, the great wall of China, the Terracotta soldiers and many other things. I have already decided I will come back to China. But without my bike. 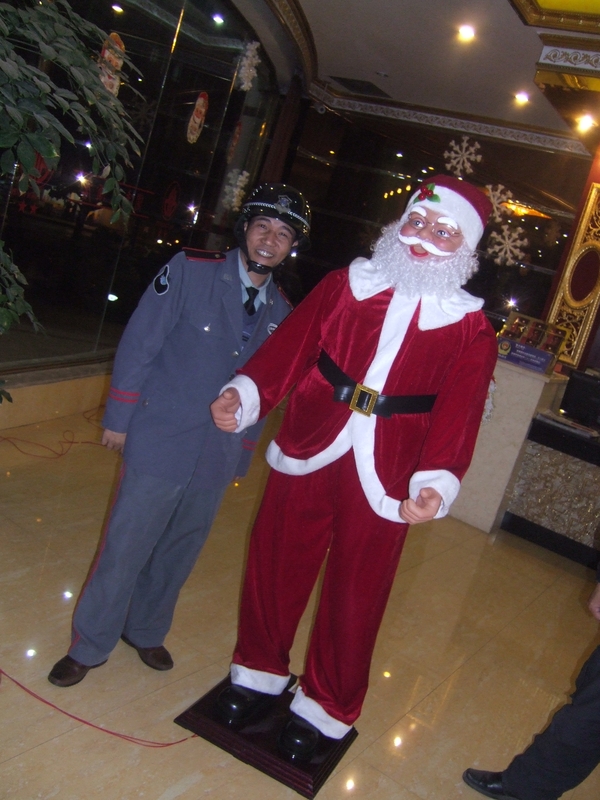 It turned out to be a bit of a problem getting out of China…………..They held me for two hours. I think they thought my British passport was fake………….it went round all the offices and things got even worse when they found my New Zealand passport as well. I was getting a bit nervous………..I told them that if they were going to hold me any longer. I wanted them to contact the British consulate in Beijing to let them know they were holding me. It must have done the trick because out of the blue they took me to the front of the que, processed me and I was on my way. The Vietnam customs took a whole 2 min. 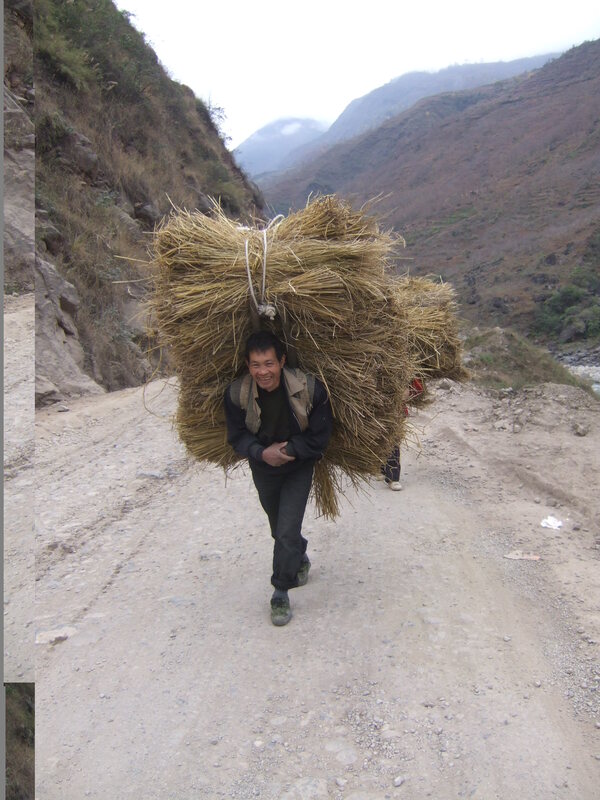 Arriving In Lao Cai I cycled a few hundred meters and cheeked in to the first Hotel…….The plan had been to push on to Hanoi which is about 250km away. But been late in the day and after a stressful afternoon I wasn’t in the mood. At the border I meet a French guy coming the other way who was in shock after having his lonely planet guide book confiscated by the Chinese because of the section on Taiwan. I had heard the rumors and I can now confirm it. I wonder where you are right now, cycling somewhere between the border and Hanoi. I am leaving Hanoi tomorrow direction Halong bay. / CatBa Island and try not to get stucked there too long, might be too touristy for me. what a trip! we met you in Dushanbe. The dutch couple in the restaurant. Maybe you remember. Since then we are following your incredible cycle jouney. Go on and a save travel. Greetings Renate and Jasper.